Kvitka-Osnovianenko, Hryhorii [Квітка-Основ’яненко, Григорій; Kvitka-Osnov'janenko, Hryhorij], b 29 November 1778 in Osnova, now a suburb of Kharkiv, d 20 August 1843 in Kharkiv. Writer; cultural and civic figure. At the age of 23 he entered the Kuriazh Monastery, but after serving as a novice for 10 months he returned to secular life. His religiosity remained a constant throughout his life and is evident in his writings. On his initiative the Kharkiv Theater was established in 1812, and he served as its first director. That year he also helped found and headed the Society of Benevolence, which provided aid to indigent children. 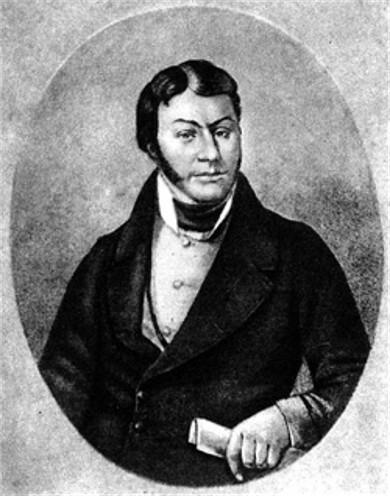 He was a benefactor of an institute for girls and served as a county marshal of the nobility (1816–28), president of the Kharkiv chamber of the criminal court (1840–3), and curator of the first public book collection in Kharkiv. Kvitka began writing rather late in his life, first in Russian and then in Ukrainian. 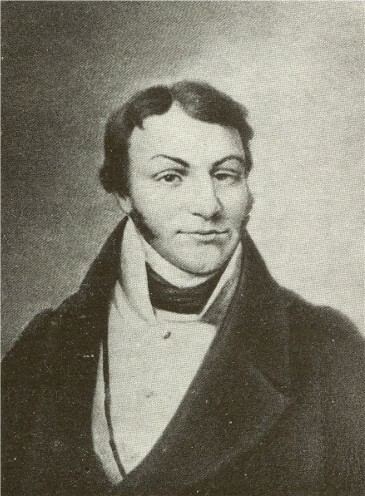 His Malorossiiskie anekdoty (Little Russian Anecdotes) was written in 1820–2 and published in 1822. Being a member of the provincial nobility, which accepted the existing social and political order as unchangeable, Kvitka never raised in his writings the issue of social or national injustice. At first he wrote in the tradition of literary travesty represented by Ivan Kotliarevsky, which viewed writing in Ukrainian merely as a pleasant pastime. His first Ukrainian short story, and the first story in modern Ukrainian literature—‘Saldats’kyi patret: Latyns’ka pobrekhen’ka po nashomu rozkazana’ (A Soldier's Portrait: A Latin Tall Tale Told in Our Tongue, 1833)—is written à la Kotliarevsky. To some extent his other humorous novelettes— Parkhymove snidannia (Parkhym's Breakfast, 1841), Pidbrekhach (The Second Matchmaker, 1843), and Kupovanyi rozum (Purchased Intelligence, 1842)—belong to the same genre. Much more important was his collection Malorossiiskie povesti (Little Russian Novelettes, 2 vols, 1834, 1837), which included ‘Marusia,’ ‘Serdeshna Oksana’ (Poor Oksana), ‘Shchyra liubov’ (True Love), ‘Bozhi dity’ (God's Children), ‘Perekotypole’ (The Tumbleweed), and other stories. In them he moved beyond anecdote and travesty and showed that the Ukrainian language can also be used for serious subjects. These tales had a great influence on the subsequent development of Ukrainian literature and won their author the honorary title of the ‘father of Ukrainian prose.’ Having plots without any social conflict, and characters who are paragons of chastity and piety, Kvitka's serious tales are typical examples of Ukrainian sentimentalism, based on both the literary and the oral tradition. Kvitka's predilection for ethnographic detail left a mark on Ukrainian prose of the 19th and even 20th century. His simple style is attributable to the generally accepted belief that to write in Ukrainian one had to view the subject through the eyes of simple folk. 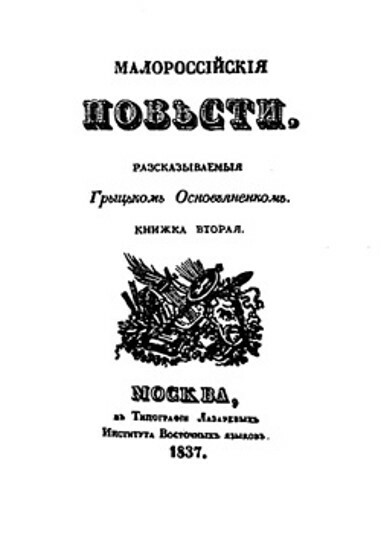 Kvitka's enduring popularity as a playwright rests on the comedies Svatannia na Honcharivtsi (Matchmaking at Honcharivka, 1836), Shel’menko, volostnoi pysar (Shelmenko, the District Scribe, 1831), and Shel’menko-denshchyk (Shelmenko the Orderly, 1837). He also wrote several comedies in Russian, including Priezzhii iz stolitsy, ili sumatokha v uezdnom gorode (The Newcomer from the Capital, or the Hubbub in the County Town, 1840), which some critics consider the precursor of Nikolai Gogol's Revizor (The Inspector-General). His most popular work in Russian was the novel Pan Khaliavskii (Master Khaliavsky, 1839). Kvitka's works have appeared in numerous editions. They belong to the Classicist period and are quite free of Romanticism, which was then coming into vogue. His major contribution was to extend the use of the Ukrainian language to ‘serious’ prose and to promote an interest in ethnography among his literary successors. He also wrote several historical studies of Slobidska Ukraine; most of them were published in the journal Sovremennik.